I’ve read your guide, and it seems to put a lot of emphasis on polos. But what I’m wondering – for casual wear – is a plain dress shirt with a cotton/wool vest on top still fashionable? I might be way behind the times because this style was pushed onto me by my granddad, and as the weather turns colder I start to dress in dress shirts + vest. First off, pair the vest and shirt well and pair them with something casual. Avoid overly dressy vests with casual bottoms like jeans or the like — while vests can work even with jeans, matching is pretty important. Moreover, avoid looking like you’re wearing the beginnings of a three-piece suit — matching vests and pants can look kinda overly formal. Second off, wear a tie if you can. 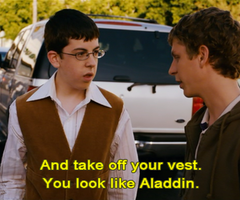 Very few vests and shirt combinations look good without a tie — in many situations, you don’t look good, but rather look a little bit like Aladdin. Finally, make damn sure any shirt you wear with the vest fits you well. A common issue with men’s vests is that they balloon out in the back, an unflattering result of a poorly tailored shirt. If the shirt is sufficiently tailored, this won’t happen.